Wikipedia: "The film has nothing except the title in common with G. K. Chesterton's 1922 book of detective stories of the same name. Hitchcock decided to use the title as he had the rights for some of the stories in the novel." Revisited the first film in the "classic thriller sextet" (Raymond Durgnat) which consolidated Alfred Hitchcock's international reputation. Charles Barr states (in English Hitchcock, 1999) that the six films came into being in a conjunction of four forces, represented by four names: Balcon, Bennett, Buchan, and Hitler. All save one were set in contemporary Britain and/or Europe. All films save one were based on novels. All save one were co-written by Bennett. All save one have a strong political dimension. All save one introduce to each other the male and the female protagonist and end on an image of their union. "To get a full sextet of films in each category, then, one needs another title and this is neatly provided by Foreign Correspondent." Charles Barr points out that the films before the classic thriller sextet "can be taken seriously both in themselves and for what Hitchcock learned from them; indeed, the thrillers that follow represent a narrowing down and in some ways even an impoverishment. Some of his profoundest Hollywood works will seem to reach back to the early English films, and to rework both formal and thematic elements from them that are not present in the thrillers. While it is not a case of Hitchcock, after unproductive years, suddenly finding himself and reaching maturity when he joins Gaumont-British, the films that follow do, however, still constitute a remarkable series." Heikki Nyman, in Hitchcockin kosketus: Alfred Hitchcockin elokuvat, osa 1: Englannin kausi / [The Hitchcock Touch: The Films of Alfred Hitchcock, Part 1: The English Period, 1994], writes that Hitchcock found in the thriller sextet a new characteristic balance between obsession and freedom (and a sense of humour). Hitchcock also discovered a new tempo, a new pace of storytelling with little regard for logic, although that tempo was not adopted in all films. Nyman reminds us that Hitchcock nevertheless kept making very different films even inside the thriller genre. For Nyman, the division of Hitchcock's films into espionage thrillers and psychopathological thrillers is not essential. The Hitchcock touch related to seeing and looking had already emerged in the director's earliest films. The 1956 remake of The Man Who Knew Too Much is also essentially a film of looks. Seeing, and especially unclear seeing, are present in the 1934 version but not as centrally and not as fully integrated as in the remake. Generally the thematic of seeing is more important in Hitchcock's psychopathological thrillers than in his espionage thrillers. Nyman observes that the homogeneity of the thriller sextet has often been emphasized, but it should not be exaggerated. A voyage structure is common to all save one. Espionage is common to all save one. Sexuality is central to two; a family theme is central to another two; a father-daughter relationship dominates one; a child is central to three. A political perspective is present in all save one. Nyman suggests that Hitchcock benefits from a relative vagueness of the political perspective in the thriller sextet (Hitler is named in none of them) as well as in North by Northwest. They have much in common as studies in the closeness of "order" and "chaos", and Sabotage is in this sense a central work. They are also studies about how an "everyman" can get caught into a vortex of chaos. In three of the films there is a breakdown of the order of a family. Besides, two further films have a family theme. Nyman emphasizes that essential suspense is based on the concept of knowledge and on the privileged position of the viewer, his privileged knowledge. The privileged knowledge of the viewer would from here on become an increasingly central factor in the Hitchcock touch. Nyman, like Barr, does not see quite The Man Who Knew Too Much to represent such a dramatic recovery in Hitchcock's work as some reviewers have found, as Hitchcock had been making outstanding films all the time. AA: A suspense thriller plot has been successfully seasoned with a Hitchcock family flavour: a passion for travel, a special love for Switzerland and St. Moritz, and a penchant for practical jokes. There is a new, more personal dimension in the thriller. In the series of Hitchcock's masterpieces of the 1950s and the 1960s The Man Who Knew Too Much (1956) is an exception in that the protagonist/s (the identification figure/s) is/are not feeling anxiety about her/himself but for another (the child). The same special structure of identification and anxiety is already on display in the original The Man Who Knew Too Much (1934). This structure evidently also has a personal background in the Hitchcock family situation. The personal story is no longer about "me" or the parents but about the child. 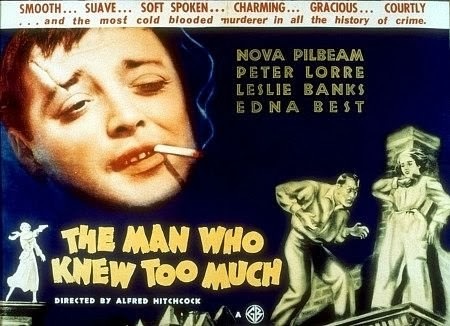 The original The Man Knew Too Much (1934) is rewarding to revisit. It is full of rich and carefully developed detail. The casting is its weakness. The actors are good, but the performances are not as compelling and engaging as they are in the remake. A major difference is that the mother plays a more important part in the original film. Her scream thwarts the assassination at Albert Hall here as in the remake. But, unlike in the remake, it is her prowess at the rifle that saves the daughter from certain death. I belong to those who take Hitchcock's political commitment seriously. The Man Who Knew Too Much was released one year after Hitler's rise to power. In many of his films from this work until Strangers on the Train Hitchcock reflected Hitler and his Übermensch concept ("some people deserve to die") in one way or other. In the cast and the crew of The Man Who Knew Too Much one may detect several people who would have had Berufsverbot in das Dritte Reich. The print is clean and complete, not brilliant, but often enough good or ok to do justice to Curt Courant's cinematography, sometimes slightly soft or duped looking. (Courant and Peter Lorre had been forced to exile in 1933. Alfred Junge had emigrated a year earlier).